Join us for First Fridays, a monthly recurring event for undergraduate and graduate Princeton alumni. On the first Friday of each month, area alumni and their guests will meet for a prix fixe luncheon at the Nassau Club in downtown Princeton. As a special bonus for PA3, a graduate student will present his/her work. Presenters and topics will change monthly. This month's lunch features Wenzhe Cao, graduate student in the electrical engineering department, discussing her research. Looking forward to seeing you...in your orange and black! For more information, contact Lydia Zaininger '83 at lydia@princetonaaa.org. Need to pay your dues to receive the discounted price? Click here. Come join PA3 alums and their guests to celebrate the Ides of March, not an ominous day at all, but merely the 15th day of the month, according to the ancient Romans. We’ll explore Italy through its viticulture in a tasting with food pairings developed especially for us. It’s been a while since we had a tasting and we’re looking forward to this one. Sign-up soon because these tastings have been very popular in the past! Cost is $30/person for PA3 dues paying members and one guest and $35 for others. The Princeton Area Alumni Association will join with Princeton alumni associations around the world in a Global NetNight: Networking Without Borders. As the world shrinks, Princeton alumni need access to a networking environment that connects them to alumni in the United States and in countries around the world. Networking Without Borders is a first step in this direction. Through LinkedIn, participants will connect with one another before, during and after the event. The event will feature Maisha Walker’94 on the subject of Networking in the Age of Social Media and a structured networking exercise over beverages and hors d'oeuvres. All alumni are invited to attend. We hope you will join us for this global event. RSVP to Kiki Karoglou*05 at karoglou@alumni.princeton.edu by 2/11/11. Update: Through generous donations, PA3 and it's members were able to contribute $5,000 toward the research grants. This money will fund at least 2 scholars' grants. The scholars will be selected this Spring. PA3 is raising funds for research grants to be awarded by the Princeton University Library to scholars from all over the world to spend a month at Princeton using the university’s unique bibliographic resources, including rare books, manuscripts and special collections. The grants funded by PA3 will be allocated to Princeton University alumni, whenever possible. The grants are up to $3,500 each. Be assured, our funding will not be "gilding the lily" --- the Library receives more proposals from highly qualified applicants than it can fund. At the culmination of each visit, the researcher will present his/her work to the university community, including alumni and guests. Even if you are not attending the Annual Dinner, you are welcome to bid on any of the items listed below. Just email us (PrincetonAreaAlumni@gmail.com) your bid by January 21st and we will enter it on the bid sheet. Those attending the dinner will have the chance to bid higher, if desired. 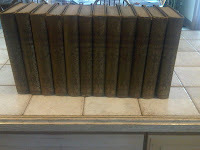 Click here for a more detailed description of the books. Time: 6 to 10:30 p.m.
Last Chance: Please RSVP right away! The Princeton Area Alumni Association annual dinner and meeting will again be held at the ETS Chauncey Conference Center. The featured speaker will be Dr. Karen Jackson-Weaver '94, the associate dean of academic affairs and diversity at the Princeton University Graduate School. She will speak on "Visionary Leadership in the 21st Century: Challenges and Opportunities in the New Millennium." The party begins with a cocktail reception and silent auction at 6 p.m. followed by dinner at 7 p.m. Semi-formal attire is requested, and black and orange are welcome. As a special project this year, PA3 is donating all proceeds from the silent auction and is accepting separate donations to benefit Research Grants for Visiting Scholars. PA3 will match donations dollar-for-dollar up to $5,000. You can preview silent auction items and read more about the program here. 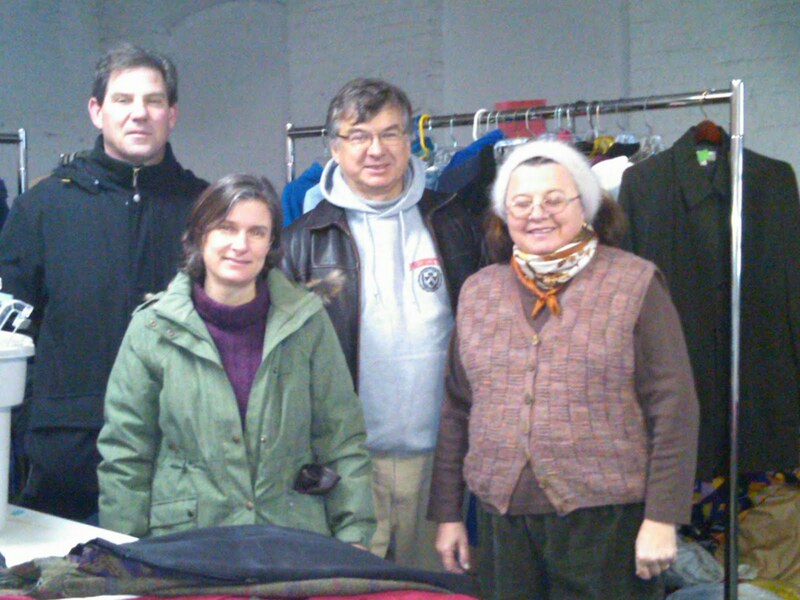 The Community Service Committee proudly reports that all five volunteers who came out to sort clothing for the Rescue Mission of Trenton's monthly volunteer day on Saturday, January 8, were from PA3. 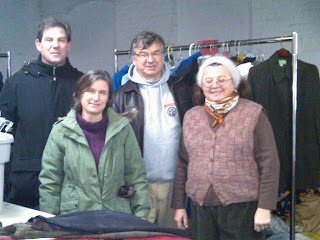 Pictured above (l-r): Joe Voigtsberger '82, Marian Zelazny p11, Olek Zelazny p11, and Halina Bustin s70. Committee chair Arlen Hastings '80 was behind the camera. 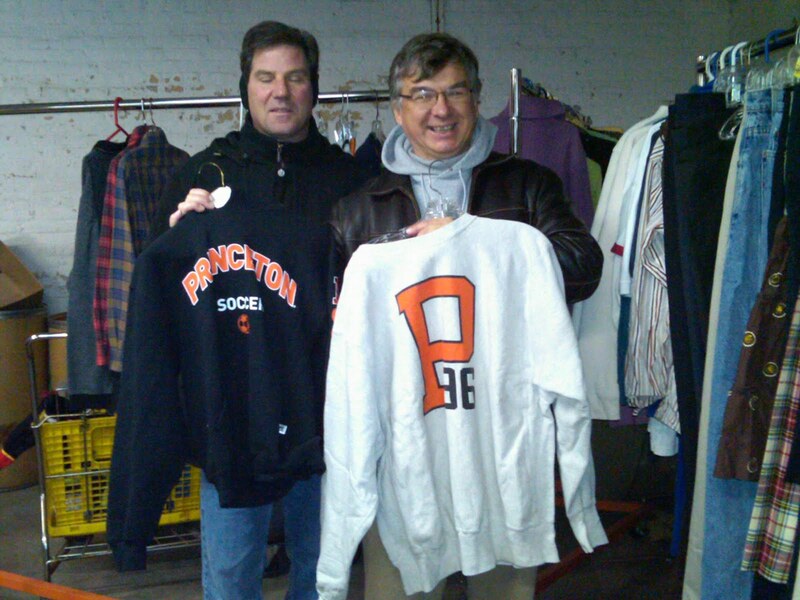 In the top photo, Joe and Olek display two of the donated items that will be sold in the Rescue Mission's thrift store. All proceeds support Rescue Mission operations. For more information about the Rescue Mission, see December 12 post.